Lawrence Okolie has sparked another heated response from Dillian Whyte by admitting he remains open to a heavyweight fight in the future. Unbeaten cruiserweight Okolie faces Wadi Camacho, with the British and Commonwealth titles at stake on the undercard of Charlie Edwards' WBC title defence against Angel Moreno at the Copper Box Arena on Saturday, live on Sky Sports. But Okolie recently declared on social media that he could defeat Whyte before posting brief footage of a sparring session. He told Sky Sports: "My aim wasn't ever to cause a stir with that, it was just a lot of people talk about me in the media and on their platforms. "When there are fighters who are below me, or coaches, or people that I won't engage, but Dillian Whyte spoke about me on the day that I posted. I didn't like what was said, so that's his opinion of my boxing, so I made my opinion on him and me boxing. "In terms of moving up to heavyweight, I believe definitely it's something that's going to happen. I always believe in myself and I've always set targets and gone and accomplished them. That's what I'll say on that." After 11 victories, Okolie intends to move towards world level in his own division, although he is willing to share the ring with Whyte at some stage of his career. We'll see how I handle Wadi and we'll see what I do at cruiserweight, but definitely that's a fight I would happily take. "I'm not going to single him out and say I'm gunning for Dillian Whyte," said Okolie. "I'm doing my own career, but at the end of the day, I don't say stuff for no reason. It is what it is. We'll see how I handle Wadi and we'll see what I do at cruiserweight, but definitely that's a fight I would happily take." 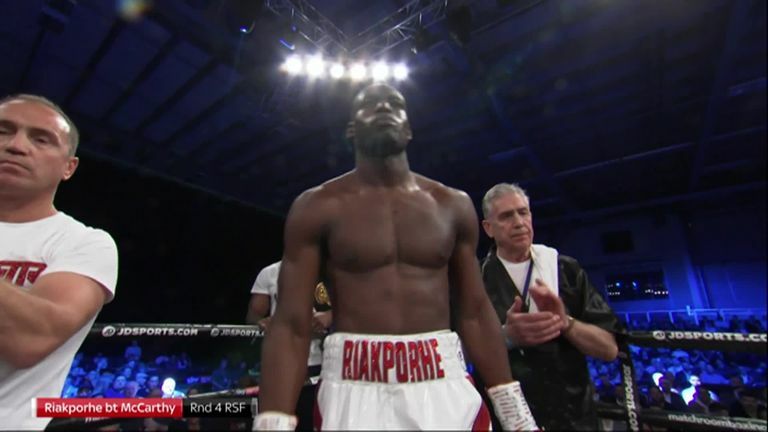 Whyte has given his own scathing account of the sparring sessions with Okolie, warning him to focus instead on a fight with rising contender Richard Riakporhe, who is managed by the Brixton man. "Look, I don't have much time for sparring stories," Whyte told Sky Sports. "Sparring is sparring, but Okolie is living on another planet. If I fought him, I'd snap him in two like a 'Twiglet'. "The last boxer to make up a sparring story about me was Chisora and everyone saw how that ended. I only sparred Okolie twice over two days in 2015 and the second time he was very arrogant, so I put a little pressure on him and he folded and had to be helped out of the ring and miss his next fight because of his injuries. "Instead of trying to get my attention, he should concentrate on the cruiserweight division where he has already twice pulled out of fights against Richard Riakporhe who I 100 per cent believe would knock him out. "Okolie is a complete hype job. He's already pulled out of two fights against Richard and that's before I even managed him. If I fought him, I'd snap him in two like a 'Twiglet'. "Okolie and his handful of supporters call themselves 'Penny Bois', which is a great name for him as that's all he'll earn off boxing, pennies; as he has no real talent, no heart, no chin and nothing about him is likeable. "If Okolie steps up to heavyweight I would end his career. He is one of the most deluded boxers in the history of boxing. Okolie is a joke, without AJ backing him, he'd still be working in McDonalds." Watch Lawrence Okolie against Wadi Camacho on the undercard as Charlie Edwards defends WBC title against Angel Moreno, with Joshua Buatsi also on the Copper Box Arena bill, on Saturday, from 7pm on Sky Sports Main Event and Sky Sports Action.